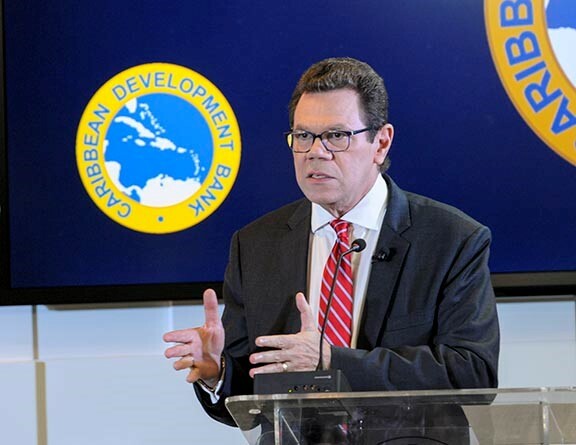 President of the Caribbean Development Bank (CDB), Dr Warren Smith, on Wednesday announced that the institution is making US$700 to 800 million available to help Borrowing Member Countries (BMCs) recover from the impact of the 2017 Atlantic Hurricane Season. The funding, which the Bank will provide over the next five years, complements its ongoing work to build resilience in the Caribbean Region, according to a media release from CDB. 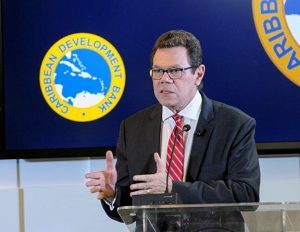 “Disaster risk management and resilience building took centre-stage again in CDB’s strategic responses to the challenges facing our BMCs,” Smith said in the CDB statement, while outlining the Bank’s 2017 performance during his Annual News Conference. “To incentivise BMCs to invest in climate-resilient infrastructure, CDB must be able to also offer grants and other attractively priced financial resources. But the challenges our Region faces are bigger than what CDB can handle on its own. We have, therefore, been drawing on a combination of our own resources as well as funds intermediated through CDB by other development partners to meet this challenge,” the CDB president was quoted as saying in the bank’s press release. In 2017, the CDB mobilised concessionary resources from development partners to support more resilient infrastructure projects throughout the Region, according to the CDB media release. Among the resources tapped was the Second Climate Action Line of Credit from the European Investment Bank totalling US$144 million, including US$24 million for emergency post-disaster rehabilitation. Last year, the Bank also announced a new US$70 million fund, through which the Government of Mexico will provide grants to boost regional infrastructure in the Bank’s BMCs. In 2018, the United Kingdom Caribbean Infrastructure Partnership Fund, a 300 million pounds sterling programme launched two years ago, will be expanded to include an additional 28 million pounds sterling to assist in the recovery efforts in Antigua and Barbuda, and Dominica, the President announced in the statement. 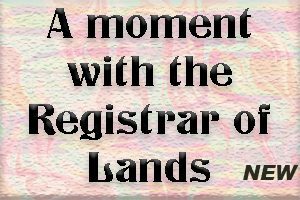 “The Caribbean has had a long history of bouncing back from natural disasters and other external shocks. So, in the events of 2017, we see immense opportunity for the BMCs to come back stronger and more resilient,” said Smith in the release, while noting that the Caribbean is the second-most vulnerable region to climate change in the world. In highlighting the Bank’s improved performance in 2017, Smith said that CDB recorded strong growth in both approvals and disbursements according to the press release. It approved capital loans and technical assistance interventions totalling US$364 million, up 18 percent over 2016. In addition, in 2017, the Bank disbursed US$233 million – an increase of 13 percent, compared with the previous year. This was achieved against the backdrop of increasing intensity and frequency of natural disasters, and greater vulnerability of its BMCs. The Bank achieved a rating upgrade to AA+ from Standard & Poor’s, and an AA+ capital market rating from Fitch Ratings in 2017, and now has a unified rating across the three major rating agencies, including Moody’s Investors Service (Aa1), the media statement said.